Alan Korwin - Who is this Man? Bloomfield Press and gunlaws.com are owned and operated by Alan Korwin. This is the largest publisher and distributor of gun-law books in America, nationally recognized as an expert resource in this narrowly focused niche. Get Alan's best books as a set, at a discount! Alan Korwin, author of six books and co-author of eight others, is a full-time freelance writer, consultant and entrepreneur with a thirty-year track record. Alan is one of the nation's leading Second Amendment gun-rights experts, with more than two decades of work in the field. He is a founder and two-term past president of the Arizona Book Publishing Association, which has presented him with its Visionary Leadership award, named in his honor, the Korwin Award. He has received two national awards for publicity work as a member of the Society for Technical Communication, is a past board member of the Arizona chapter of the Society of Professional Journalists, and has been active with the speakers bureau for the Wash., D.C.-based news-media watchdog, Accuracy In Media. Mr. Korwin wrote the business plan that raised $5 million in venture capital and launched the in-flight catalog SkyMall; he did the publicity for Pulitzer Prize cartoonist Steve Bensons fourth book; working with American Express, he wrote the executive-level strategic plan that defined their worldwide telecommunications strategy for the 1990s; and he had a hand in developing ASPED, Arizonas economic strategic plan. Korwins writing appears often in a wide spectrum of local and national publications. Korwin turned his first book, The Arizona Gun Owners Guide, into a self-published best-seller, now in its 26th edition. With his wife Cheryl he operates Bloomfield Press, which has grown into the largest publisher and distributor of gun-law books in the country. It is built around ten books he has completed on the subject (he has written 14), including the unabridged federal guide Gun Laws of America, and a rapidly growing line of related books and DVDs. Supreme Court Gun Cases was his 10th book and landed him on the cover of the 600,000-circulation magazine below. He was invited by the U.S. Supreme Court to attend oral argument in both D.C. v. Heller, which led to his 11th book, The Heller Case, and McDonald v. Chicago, in which his firm Bloomfield Press was an amicus. The cases established the Second Amendment as an individual right, and applicable to the states, respectively. Alan is widely recognized as a leading expert on America's gun laws, and has made more than 1,000 radio and TV appearances, including the national news shows. His 12th book, After You Shoot, has motivated changes in Arizona's judicial system and bills in state legislatures that continue to percolate. 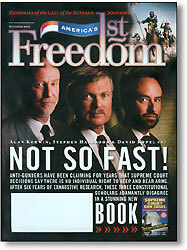 Alan Korwin, Stephen Halbrook and Dave Kopel (L-R) on the cover of America's First Freedom magazine after the release of the unabridged Supreme Court Gun Cases in 2003. The book was ranked as one of the Top Ten Second Amendment books of all time. After You Shoot questions the paradigm on what to do after a lethal-force incident. The Heller Case examines one of the most significant Second Amendment cases in history, and summarizes the other 96 gun-related High Court cases decided up to that point (there are now more than 110). Click the book images for details. 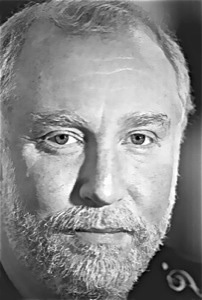 Alan Korwin is originally from New York City, where his clients included IBM, AT&T, NYNEX and others, many with real names. He is a pretty good guitarist and singer, with a penchant for parody (his current band is The Cartridge Family). In 1986, finally married, he moved to the Valley of the Sun. It was a joyful and successful move. NOTES: Korwin's first book, The Arizona Gun Owner's Guide, came out in 1989. It explains the state's gun laws in plain-English and has spawned a series of guides that included California, Florida, Texas, Virginia, and an unabridged edition of the federal gun laws, Gun Laws of America, with more on the way. His book, Wickenburg! The ultimate guide to the ultimate western town, features a foreword by Barry Goldwater, and his full-color book Scottsdale, published by American & World Geographic Publishing came out in 1995. In 1997, HarperCollins released Safe Not Sorry, by Tanya Metaksa, which features three supplements Korwin wrote on national firearms law. His co-written book, Supreme Court Gun Cases, released at the end of 2003 after six years of effort, chronicles the entire High Court jurisprudence on guns. That book is in the High Court library, which helped him secure a reserved seat for oral argument in the D.C. v. Heller gun-ban case, which became his 11th book, The Heller Case: Gun Rights Affirmed! A partial list of Mr. Korwin's clients includes: American Express, SkyMall, ITT, Intel, IBM, AT&T, Motorola, MicroAge, Wide World of Maps, Kroy, Three-Five Systems, NYNEX and The Mesa Varmint Callers. "A much needed and very timely new book." "Every gun owner needs a copy of the guide." I suspect your insights have changed my life." Alan, I cannot express how much our entire group appreciated your speaking to us at our last Legislative District meeting. You covered so many important topics I can say I have never even given Congressmen as much time as I gave you at our meeting. I knew you ran way over the allotted time frame but I wanted to hear more and I could see in the faces of our members that they would have lynched me if I had tried to cut you off. Thank you so very much for the excellent presentation to our group! We will put into practice many of the ideas you left with us, especially about watching and dealing with the media. I look forward to having you back in the future! Hope you get lots of speaking engagements... you are very worthy of large audiences! "This book proves what NRA has been saying all along the Second Amendment protects an individual's right to keep and bear armsa freedom existing before America's founding and enshrined in our Bill of Rights." Alan Korwin reminds me of his favorite dueling truisms: Chairman Mao said that power comes from the barrel of a gun, Ronald Reagan averred that power comes from the barrel of a pen. He is not your stereotypical Second Amendment crusader. He is prone to garish shirts and plays a mean guitar. He does not wear a sidearm in public. He does not take guests to his home to fondle his arsenal... He is witty, well-groomed and has enjoyed success as a writer, consultant and lecturer. He speaks not with a squint-eye twang, but articulately, in a measured Bronx brogue. He writes even more elegantly than he speaks. He has authored and published (through his Bloomfield Press) seven books on gun laws. His first tome, The Arizona Gun Owner's Guide, is in its 19th printing. It has sold in excess of 100,000 copies. Last Friday, Korwin convened his annual Bill of Rights Day luncheon. He and a dozen other men -- mostly professionals -- met at Omaha Steakhouse to observe the birth of the hallowed document, which was ratified on December 15, 1791, in Philadelphia. The parchment was read aloud with reverence. The group broke bread and bemoaned society's indifference to erosion of the rights bestowed in the bill. These gentlemen venerate the Constitution. As do I.
Alan - Thanks for your tireless efforts - you're amazing! (Bob Hisserich); Alan: I have to say, you are getting better all the time. Great stuff! (Woody Wilson); Hang in there Alan. You're our hero. (Charlie); Alan, as usual, thought-provoking and anger-provoking commentary on what passes for journalism in America. (Dave Maneck); plenty more where that came from at Page Nine. 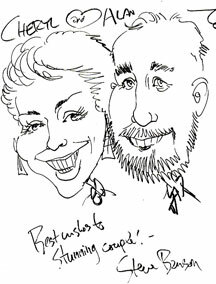 impression of Alan and Cheryl Korwin. Alan Korwin wrote his first book, The Arizona Gun Owner’s Guide, in 1989. It is now in its 26th edition with about 250,000 copies in print. He went on to write or co-write nine more books on gun laws, including state guides for California, Florida, Texas and Virginia, and the unabridged federal guides Gun Laws of America and Supreme Court Gun Cases. His 11th book, which debuted in 2008, is The Heller Case: Gun Rights Affirmed!, and his 12th, After You Shoot, is about the deadly loophole in self-defense law. He recently completed Your First Gun, for people new to gun ownership, and for gun owners to give to their gunless friends. With his wife Cheryl he operates Bloomfield Press, the largest publisher and distributor of gun-law books in America. His website, GunLaws.com, features a free National Directory to every gun law in the country and more than 300 books and DVDs for gun owners and the freedom movement. Alan’s blog, PageNine.org, is carried by scores of paper and online outlets. Wild rumors about his outrageous political-parody band, The Cartridge Family, could not be confirmed at press time. Alan Korwin is a full-time writer whose three-decade background includes work in business, legal, news, and entertainment industries. Mr. Korwin wrote the business plan that raised $5 million in venture capital and launched the in-flight catalog SkyMall. He did the publicity campaign for Pulitzer Prize cartoonist Steve Benson’s 4th book Where Do You Draw The Line. Invited twice to the U.S. Supreme Court to observe oral argument in Second Amendment gun-rights cases, he has written 10 of his 14 books on that subject and is among the leading national experts in that field. His 13th book, Bomb Jokes at Airports, deals with dangerous and growing limits on free speech, and his political-parody band, The Cartridge Family, is helping to spread peace and freedom through music... and threats if necessary. 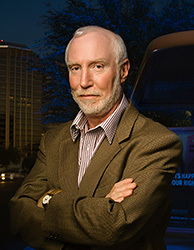 The winner of the 2013 Defender of Liberty Award, Mr. Korwin is based in Scottsdale, Arizona, where he runs GunLaws.com and Bloomfield Press, the largest publisher and distributor of gun-law books in the nation. “Alan Korwin has been making a decent living as a full-time freelance writer since 1984. He is a founder and past president of the Arizona Book Publishing Association and a former board member of the Society of Professional Journalists in Phoenix. “His clients include IBM, American Express, Intel and anyone else with a checkbook and a bank guarantee card. He is a frequent guest on radio talk shows, television news programs and is an advisor to several national advocacy groups. “Alan's first book, the Arizona Gun Owner’s Guide, is in its 26th edition, and he wrote the unabridged guide, Gun Laws of America. He completed Supreme Court Gun Cases in 2003, The Heller Case: Gun Rights Affirmed! in 2008, and completed his book on free speech, about 186 things you can't say anymore, entitled, Bomb Jokes at Airports in 2011. His newest book is Your First Gun, for people new to gun ownership, and for gun owners to give to their gunless friends. Why do people invite Alan to speak at their meetings? Thanks for a wonderful presentation, Alan. You delivered more than promised, provoked discussion and encouraged us to question what we “know” to be true. I especially appreciated your recognition of the creative energy within all of us.